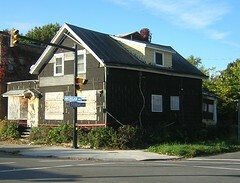 The future famous ruins of Buffalo may one day include this place at 564 Dodge Street near North Parade. Here's the map and cool satellite pic. You'll quickly notice the proximity of the Olmsted Park system to the German Roman Catholic Orphan Home and today's ever growing and increasingly larger "urban pairie" here in on the City's East-Side. On Wednesday I had the unexpected opportunity to tour the property with my "urbex" partner and tag along with the maintenance guy. He took some boards off and allowed the current owner's - Community Action Organization - real estate apprasier to study the structures and determine whether the property has any current economic value. The timing was perfect. The rain had stopped and my "urbex" partner and I were coincidentlly in the right place at the right time. I've gathered the best pics and arranged them in two differnent slide shows. I've placed this complex of buildings on a tour that I will be leading with the full support of the Preservation Coalition of Erie County next summer. Meanwhile check out the links below and especially this site for some of the early history and remembrances of this place. The pictures below are taken from that site. May 1, 2005 - Where did the people go? I first started writing about the former German Roman Catholic Orphan Home back in January. Here, I sited a positive move by a local congregation and used the GRCO as an example of piss-poor diocesan planning. 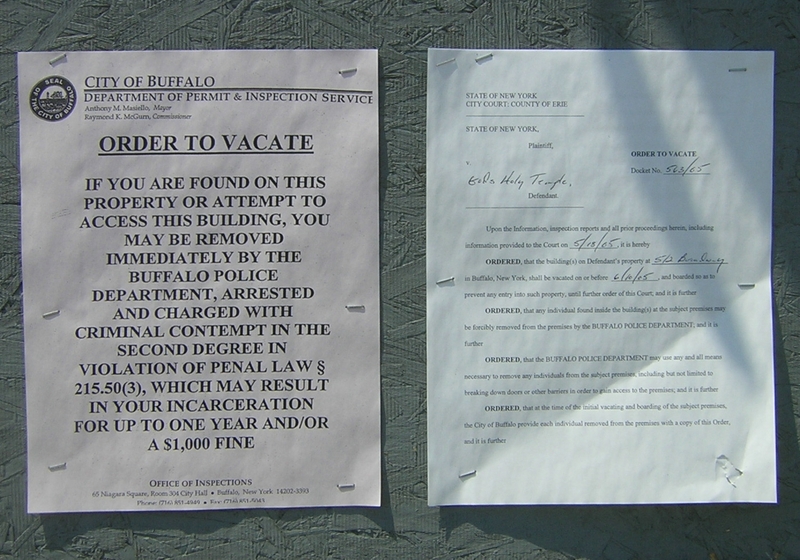 Bishop Kmiec of course is planning to slam the door closed on a number of additional Catholic Church properties here in the City very soon - see, Journey to Avoid Housing Court - as he continues to live in the most expensive, highest assessed residential structure, in the City of Buffalo. 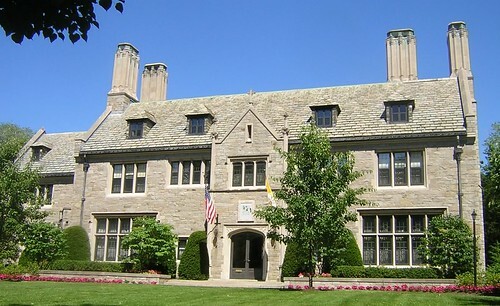 Again, here's the Bishop's residence at 79 Oakland Place. 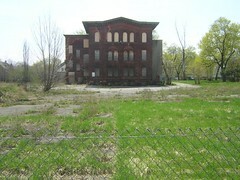 While Bishop Kmiec continues to reside at 79 Oakland Place, in the most expensive (highest assesment) residence in the City of Buffalo, it's helpful to remember what happens to former Catholic Church property when it's "flipped" to unsuspecting and irresponsible owners on Buffalo's east-side. Looks like we just paid for a live webcam of Duke Realty's new empire behind Buffalo's City Hall and the construction of BCBS/HealthNow's Atlanta style suburban office park. 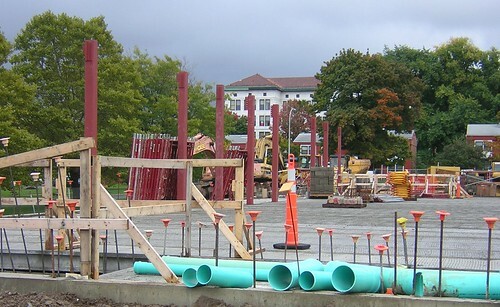 The webcam has a "game-like" controls so you can watch the construction site. After trying it out for the first time I couldn't swivel it all the way around to see the new cul-de-sac and 150 car parking lot being built in the middle of Court Street. I'll try again, next week. Depending on your system the webcam may take a few moments to load. I first started writing about Duke Realty and the migration of 1200 jobs from my Masten neighborhood to an isolated suburban style office park a few months ago. Remember, former Erie County Executive Dennis Gorksi is BCBS's "go-to" guy for governmental affairs. Related Posts: Get ready to Duke it Out and We've Been 'Duked', Really! Duke Realty (NYSE- DRE) shares closed up slightly on Friday at $34.90 Look at all the beautiful "suburban style" office parks Duke Realty has built. Last week I posted a short piece about the work of Jane Jacobs and my own obervations about "demolition season" here on the City's near East-Side. I re-posted an update reflecting one reader's own work and obervations about Jane's urban analysis. This update contains numerous more scholarly references to Jane's work. 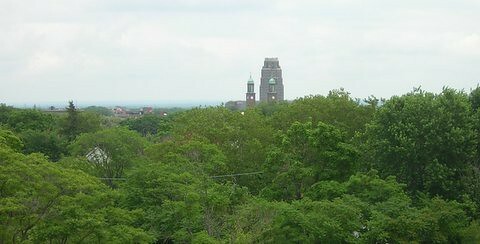 The full-text of the papers presented at a Boston College symposium, Jane Jacobs & the New Urban Ecology are all available. 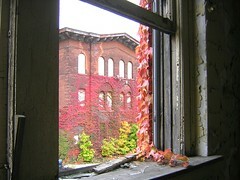 A second reader responded with some additional personal observations about the decline and "detroitization" of Buffalo. He sent me two e-mails. This is the first...containing a number of personal observations and reflections about the neighborhood where he was raised. I am originally from the Old East Side. When I was a child it was an all German neighborhood, cohesive, beautifully kept -- a real joy. 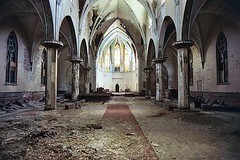 During the 1950s it turned into the terrible ghetto, the remains of which are still sitting in ruins today. The "downfall" started right where we lived -- between what is now the Masten neighborhood and Humboldt Park -- and spread like a fast-growing cancer. My grandmother and parents did not flee because they were racist. The story has never been properly told or documented. It's hard to get people not to misunderstand that describing the Jacobesque downfall of the East Side and Downtown -- the two were simultaneous -- is not somehow "racist," since African American "migrants" were used in the scheme and made the new ghetto-dwellers. It's just the most sad story. When I was last in Buffalo after my mother died and walked the streets where I was a child, I literally almost wept. The lovely buildings on Dodge Street boarded up, with a "For Sale" sign by Scott Wizig; the Home of the Good Shepherd, two city blocks full of wonderful Gothic buildings between Best and North, Timon and Johnson, with the originally buff-colored walls painted gray (to cover the graffiti) and the remnants of barbed wire left from the days when it was the juvenile corrections facility still visible; the houses my great-grandfather built that served us for four generations razed; wonderful "walking-lifestyle" shopping streets like Genesee and Jefferson completely decimated and "vacant." People who don't have roots and first-hand knowledge of this story get some "stilted" viewpoint that comes from academic imaginations -- they just rave on about "racism" having killed Buffalo. That is so superficial and insensitive! I hope before too many years pass to be able to be resident there again and do research on exactly what happened. This is the second e-mail and contains a number of references to the work of Jane Jacobs. The piece is very interesting. The fact that your intro starts by speaking of your pondering all the demolitions in the Masten area lately is also. I will assume whoever reads what I say has read what you highlighted. Jane Jacobs says in so many ways what people never seem to "get" -- i.e. that there has to be an indigenous economic engine for there to be a vital city. You can't put "trinkets" copied from other cities in the midst of an empty or "poor" core and expect the accoutrements themselves to draw and keep people. So ideas of convention centers, casinos, and other "big item" "deals" to "bring people into Buffalo" are nonsense. First there has to be something "organic," something that represents vital activity that is in and from and about Buffalo to "be there" before any of the "adornments" of cities will work. The fact that Buffalo is "empty" to a great extent, particularly its East Side, is that the indigenous ethnic groups who inhabited it and "fed" the adjacent downtown were broken up and moved to the suburbs in the '50s and '60s. Here's where some of the "slumlording" and other city-smashing ideas Jacobs writes about elsewhere need to be understood -- i.e. 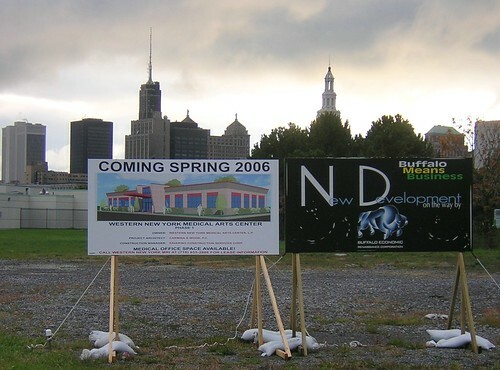 if one wants to understand how Buffalo became "so empty." A ghetto of alienated, welfare-dependent victims of nefarious schemes could not replace economically or in any viable way the strong middle classes of the indigenous ethnic groups (which I will continue to maintain, as I know so from my own personal observation and upbringing in the midst of the fiasco, was not an "organic" development). Then, too, in the interview quoted with Bromley and Tielman, Jacobs makes the point that Buffalo did see itself as a "branch plant" town, and doing so was a very hurtful thing to do. Bringing "things" in to provide a non-indigenous economy, if it is all a city is depending on, is always a mistake. The "enterprises" use the city they were "brought to" to their own profit, then skip town when labor is cheaper elsewhere or other advantages that are selfish on their part motivate them. The main point Jacobs is making is that you have to have "indigenous" vitality and economic and other activity that provides an "engine" (my term) for a city. Given that Buffalo has lost so much population and suffered so many schemes that displaced people to the suburbs (Jacobs says it herself -- people who "flee" to suburbs and claim to like them have had negative experiences as they were caught in the midst of urban problems -- Yes -- so true! ), it needs a "huge" new "engine." So what large new engine could there be that is comprised of Buffalo's people, important processes, and major affairs and that serves Buffalo and could serve it uniquely even more? It has been proposed on this list and in many circles that Buffalo's large, locally indigenous and productive "engine" is unfortunately stuck out in Amherst -- viz. "SUNY Buffalo." When the University OF Buffalo was "talking about" joining the "state system," people had just the fear and reservation that came true -- viz. that the City of Buffalo would not be the focus of the university any more, that Buffalo would "lose control" of it. Behind closed doors and in an amazing display of secrecy, SUNY (at first called SUNYAB -- yuck!) was put out, in gray, stolid pieces on the wind-swept plains of Amherst. 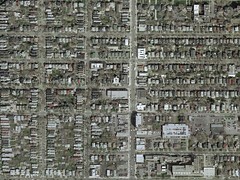 The most sensible way for Buffalo to regenerate is to bring a major -- probably the only left -- part of its "heart" back into the City and spread it out amidst Downtown and the East Side, the areas most needing the economic engine. Can't you visualize the restored buildings, the dense housing, much of it also restored, the services, the support businesses, the trolley cars and light rail, all the activities? This would make Buffalo an interesting place for people to come to. A casino to drive to and away from, a sports arena, or a convention center -- none of these do anything like the university. Universities are famous for being great supporters of local small businesses -- they breed them in exponential ways. The creative talent, the education of people, the service to community -- all are inherent in an urban university. Right now SUNY - Buffalo is absolutely a misnomer. 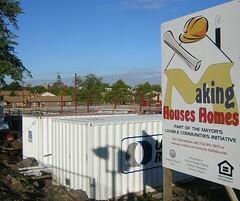 The largest project being done that is similar to this idea is occurring right now in Phoenix, AZ, of all places, where the President of the State University and the Mayors of Phoenix, Tempe, and most "valley" cities are all in agreement that the entire community, especially the previously quite uninteresting and somewhat "down" downtown in a metro area of some 6 million people, needed the economic, cultural, and social vitalilty that the huge university inherently promotes. The entire idea has seen no "split" between the state university and the city. Ideas like this one have been tried and succeeded to fruition in many areas of the U.S.A.
Why can Buffalo not "get to" this ideal? It is so insane to imagine that convention centers or pedestrian malls can make a city when there is no social-cultural-economic core to the city!!! Waiting only for small shops to constitute an entire gutted city is also naive. These small businesses thrive around a "heavier," more central indigenous core. Michigan Avenue is experiencing a series of transformative developments here on the City's near East Side. Lots of residential demolitions, new residential and commercial developments that seem to compliment the growing number of formerly owner occupied and now empty houses along the avenue. 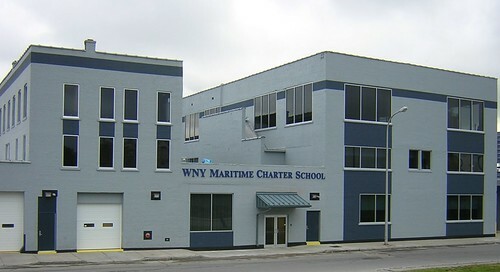 At 833 Michigan Avenue the new WNY Maritime Charter School opened on schedule in September. The only web information that I have found so far is this static site. A welcome addition to the growing number of educational opportunities here on the near East-Side for students, the WNY Maritime Charter School renovated an empty structure that was last occupied by Carton-Craft a few years ago. I've been a huge fan of charter schools since they first appeared on the local scene. Like many of my neighbors, I think that school choice is all about the new "civil rights movement." Right across the street from WNY Marine Charter School, I saw this sign...yuck! Maybe, Dennis Gorski has hand in this pie, too! Seems like the near East Side is getting slammed with suburban style design...this will be located adjacent to the 33 bridge that crosses Michigan Avenue. Click here, to see all the empty space...for parking! Perhaps someone could explain what is meant by "medical arts." Closer to Cold Springs, and driving North on Michigan...I took these photos of a new housing project that is being "photo-shopped" into the urban scene. 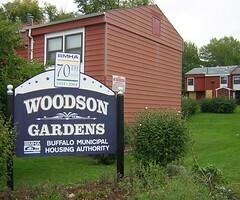 You'll quickly see that directly across the street at Woodson Garden, a lovely development built in 1983 by the poverty pimps at BMHA, you will see a number of boarded buildings. I counted 30 units in the residential complex and 4 of them were boarded. Another 8 appeared to be vacant. Continuing north along Michigan Avenue at Dodge Street, things are happening at a dizzyiing pace. Here's what the four corners looked like last week. 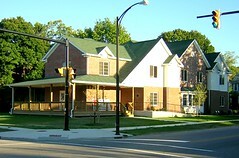 That new build on the south east corner is a shelter for young mothers. It is opening this week. Make sure to click on this link. 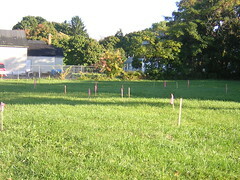 It shows that ever increasingly larger and growing "urban prairie." And here's the definition of the "urban prairie." Well late yesterday afternoon, and on my way home from some rather exciting "urbex" over on Dodge Street...(developing story)... 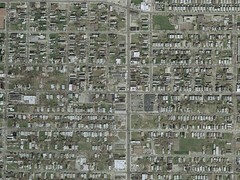 I snapped these two additional pics of the north east and north west corners of Dodge and Michigan. Brand new residential development...Later today I saw this same piece of heavy equiptment breaking ground and digging a new foundation right where it sits in the pic. Along Michigan Avenue the mantra seems to be....out with the old and in with the new! Huge changes...no debate or public input...and our city is "photo-shopped" literally overnite. Lots of stuff going on further down on Michigan, too. 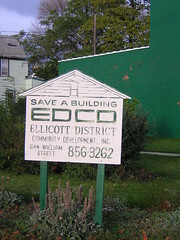 Of course we have the new and recently "moth-balled" Erie County Emergency Services Building and the transformation of the area around Michigan Avenue Baptist Church and the Colored Musicans Club into a new historic neighborhood. I promise to have pics of these developments, soon. And don't forget about Artspace coming to this side of Main Street, soon. Already, I heard that houses along Coe Place are beginning to experience the first signs of "gentrification" and did someone say....shhhh...rising property values. Can't be. It's Buffalo...and the East Side. Finally! I've been reporting on various demolitions here on the near East-Side, in Masten. Six residential structures have been taken down along Michigan Avenue in the past few weeks and an equal number on some of the side streets. Nothing, however compares to this demolition just a few short block away at Main and High streets. Here's what Erie County Preservation Coalition member Greg Lodinsky had to say about this demoliton in a letter he wrote to the Buffalo News. The "Esenwein and Johnson in Buffalo" exhibit at the Buffalo and Erie County Historical Society highlights two gifted architects who established and maintained a Buffalo firm for more than 30 years. The exhibit features photographs of some of their best known works: the Electric Building, Lafayette High School and the ill-fated Temple of Music, scene of President William McKinley's assassination. One of the most interesting buildings was designed by August Esenwein in 1893: the German-American Brewery and Hall, located at 23 High St. 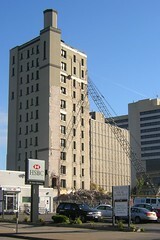 This is the same building, now altered, undergoing demolition at Main and High streets. 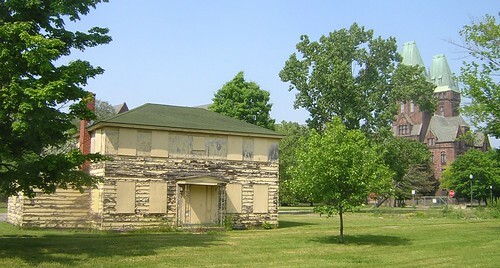 Contrary to the article in the Oct. 11 News, this was not a "derelict" building. 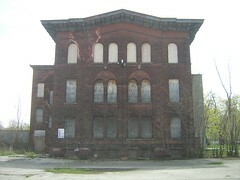 Structures of similar condition are now being renovated into luxury lofts in Toronto, Chicago and, yes, Buffalo. 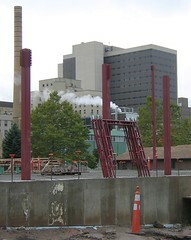 For the brewery, this was not meant to be, another piece of Buffalo's heritage struck by the wrecking ball, soon to be known only in historic picture. We are losing our history, and with it, our civic soul. Stop by Main and High, raise a glass and imagine the German bands playing, the dancing and the rollicking times this building saw; a bitter irony during Oktoberfest to see it go. Here's a rendering of what's proposed for the site. Under a joint venture between AIDS Community Services and Clover Management, Evergreen Center, a $10 million, five-story medical services and research center, will take root at 23 High St. The new 50,000-square-foot complex will allow the organization to continue providing HIV/AIDS prevention and care, while adding research to the mix, said Christopher Voltz, director of marketing and special projects for AIDS Community Services. 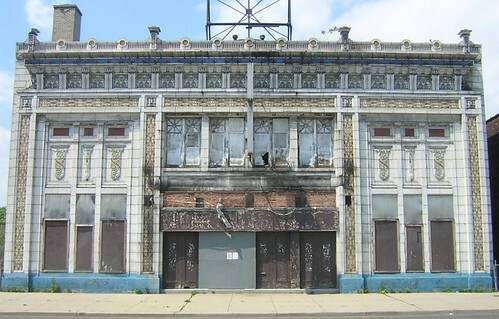 While checking out a few properties here on the City's East-Side last weekend, I was on William Street and stopped by the former "Roxy Theatre" at the corner of Krettner and William. Make sure to click on that map to see the 'urban prairie" in this part of the City. I walked around the place and spoke to an older woman who was wondering what I was doing. Betty told me about the "cartoon movies" she used to see at the Roxy 60 years ago. Back then she told me, movies were about 25 cents. 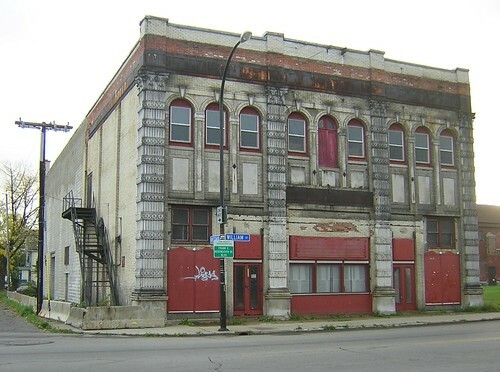 And while on the subject of Buffalo's abandoned East-Side "Theater District" how 'bout this one at 512 Broadway. Click on that link and look at the "urban prairie" in this neighborhood, too. Check out what's hanging on the door. the corner from the former theatre district! Buffalo - Artist Lofts - A project...coming soon? Wow...NYS is finally spending money on the Psych Center! I missed Sam Hoyt at the Psych Center this past June by a few minutes. I took these pics and asked a few people when the other houses here were going to come down. Just heard that NYS is spending some more of our tax money to demolish these and Sam Hoyt will be "witnessing" the demolitions on Friday October 21, 2005. I tust someone will publicly ask Sam Hoyt where the phantom $100 million is that was promised, oh when...once upon a time. And speaking of preservation...I remember some rather snarky e-mails from Sam about this...ouch! Related Posts: Sam Hoyt & Preservation...A Curious Mix? I've had a surge of activity linking to this page via the wikipedia "urban prairie" entry. Usually 10-12 hits/day from there. Today 250+ Someone, please let me know where you're coming from, who's linking...thanks. Chances are you arrived here from a search on Wikipedia for "urban prairie" Please take a moment to check out some of my recent posts. Especially a series of two recent posts about Buffalo's accelerating rate of population loss as recentley presented by two Wharton School professors at the University of Pennsylvannia. I've also linked to their study. Here and recently 7/Day - One every Three Hours! Yeah, I've got demolitions on my mind as some of the recent posts documenting the spike in residential demolitions in this little 25 block area of Masten further explain. Every time a house comes down over here on this side of Main Street, the foundation is filled in and we wait for mother nature to visit with her very own 'weed and seed' program. Grass seed, no. It's just not in the budget. 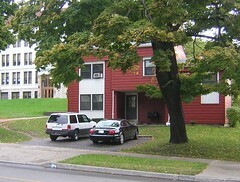 Compare these two images of the built environment along Utica, here in Buffalo. The shot on the left shows the intersection of Utica and Elmwood Avenue. 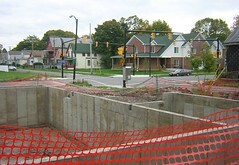 The image on the right shows what life looks like a mile away at the intersection of Utica and Jefferson. No, all the green spots have nothing to do with what the good people at the Olmsted Parks Conservancy are doing to our city. Here in the 'hood this is called the 'urban prairie.' A more abstract way of imagining the ever increasingly larger 'urban prairie' is to think of missing houses and all the recent demolitions here in Masten as, you guessed it, our shrinking tax base. Wandering around the 'hood the other day I snapped this pic. The sign is hanging near an entrance to the former Buffalo Traditional High School here in Masten. Imagine 700-800 students jamming into a place designed for 205! I remember the 'duck and cover' exercises in grade school that might have been part of the same charade back in the day. 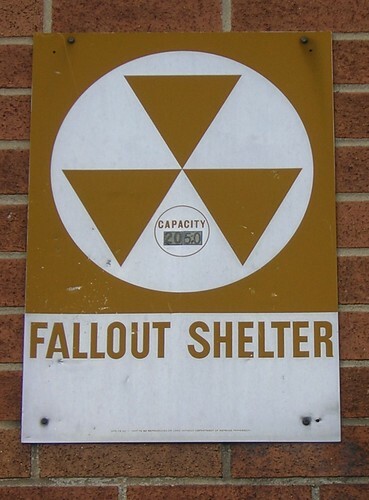 Are these shelters still active? I thought at one time Erie County Civil Defense, with bunkers out in Chestnut Ridge Park were administering programs like this. Related Posts: Duck & Cover, the movie and Bert the Turtle. Ersosion in the natural world is a slow and steady process. And like 'demoliton by neglect' it happens on a daily consistent basis. Here in the 'hood 'demolition by neglect' happens on a daily basis, too. It's often un-noticed as we weave our way down Elmwood and plan for other sorts of events. I mean, just ask yourself. Would you really want this property in your backyard or on your street? Would you want to live nextdoor? Take a moment to click thru the Monthly - Updates from the previous 18 months to see erosion in action as the long slow and steady progress of 'demolition by neglect' firmly establishes itself here, in this little corner of Masten District. Citizens Regional Transit Corporation seeks to educate the public, public officials, their authorities and agencies in the Buffalo-Niagara region about the benefits of a comprehensive transportation system including an expanded Metro Rail. 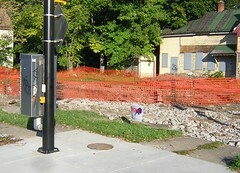 Keep thier work and mission in mind as you think about the right location for the new 14209 Post Office here on Main Street. I mean why not locate the new building next to the Metro or better yet replace one of Buffalo's best examples of 'brutalism' - Utica or Summer Station - with an integrated retail, post-office subway stop building. 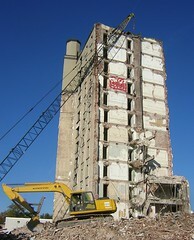 Thinking about all the demolitions here in Masten recently has got me thinking once more of Jane Jacob's work. I last wrote about Jane Jacobs a few months ago, over here. I first stumbled across her work and posted, Required Reading, in January. In Writing the City, I've linked to a few interviews that Hank Bromley and Tim Tielman assembled a few years ago. They are well worth revisiting as we continue to stumble "managing the decline" here on this side of Main Street. HB: I thought I’d start by asking how you started writing about cities and what makes them work. JJ: Well, I really explain all that in the Introduction to The Death and Life of Great American Cities. In brief, I was working for an architectural magazine, and I became dismayed at how unrealistic the plans that I was writing about were. I saw that they didn’t really make very magnetic or attractive city areas; people seemed to shun them instead of enjoying them. And then I was fortunate in having a good mentor who had been thinking about the same things, the head worker of a settlement in East Harlem. And he got me thinking along the lines of how city streets work. HB: In ways that professional planners hadn’t really been considering? Continue reading the interview with Jane Jacobs, over here. 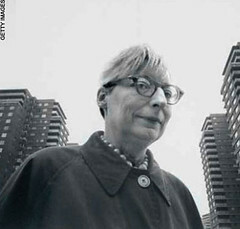 Just received this link about the life and work of Jane Jacobs from a frequent reader of this blog. See the comment below. Thanks Ken! The site includes Random Thoughts from Jane Jacobs. A must read if you are into urban planning and thinking issues.